Our Crooked Branch: Dr. Addi? Today, Addison went with me to my 30 week doctor's appointment (I was running late). The nurse came in, weighed me, listened to the baby's heartbeat, and measured my belly. Everything was perfect, FYI. 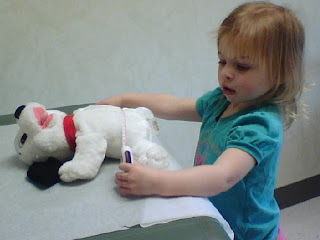 The nurse left Addi and I alone for a few minutes to wait for the doctor, and Addi put her doggie on the table and measured his belly like the nurse did to me!!!!!! It was pretty cute... Maybe she can buy me that summer house in Florida someday! Oh, thanks to everyone who voted in our poll. It's official, we are going to have a big baby! 30... It's really just a number... Right?